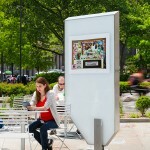 Streets occupy nearly a quarter of New York City’s land, however there are limited outdoor spaces to socialize, sit, and enjoy city life outside of parks. As part of an effort to improve the quality of public space for all New Yorkers, the NYC Department of Transportation (NYCDOT) has been developing new public open space by converting underutilized street spaces into pedestrian plazas. 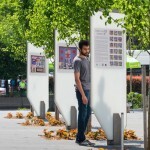 With dozens of plazas already open and functioning across the city, the NYCDOT has been looking to polish the new spaces, installing permanent designs, improved benches, and now, specially designed signs to showcase public art. 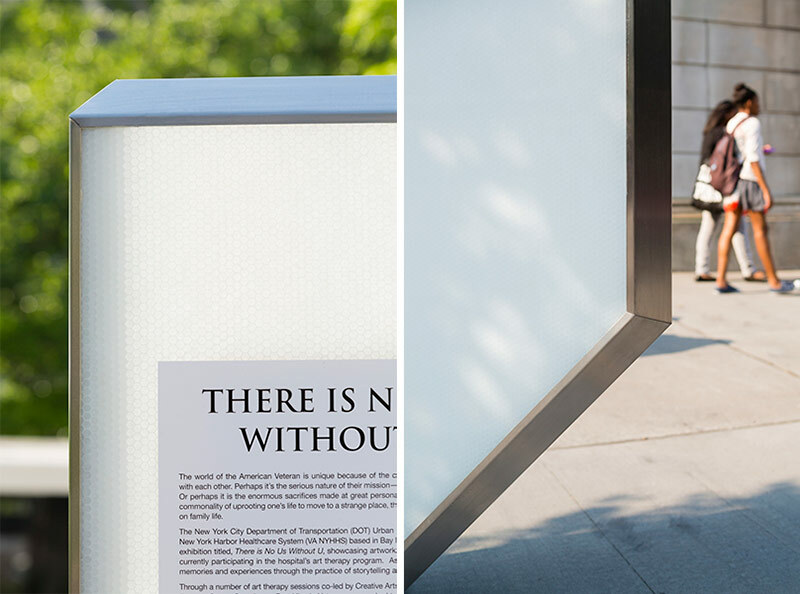 Ten art display cases were on view from May through late August 2013 at Brooklyn’s Willoughby Plaza—one of the city’s first asphalt strips once dedicated to cars and subsequently transformed into a pedestrian space. 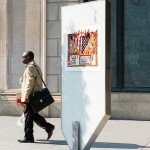 The signs were part of NYCDOT’s Urban Art Program and were part of its inaugural show titled There is no US Without U. The sail-like panels were designed by the NYC-based architectural and urban design firm Architecture Research Office (ARO) and were fabricated by Rhode Island–based custom composite construction leader Goetz Composites. 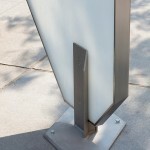 Each panel is composed of three integrated elements: a sail-like field material involving an anti-graffiti coating, beveled panel edges clad in stainless steel, and stainless steel panel bases connecting the panels to the ground. The idea takes inspiration partially from recreational equipment and incorporates materials typically associated with boats. DOT sought a prominent boat builder to collaborate with the design team to create the construction details and assemble the prototype, which was exhibited last year at Bogardus Plaza and Water and Whitehall Plaza. Through an art therapy program at the VA New York Harbor Healthcare System, veterans created the featured artwork shown on the new display kiosks. 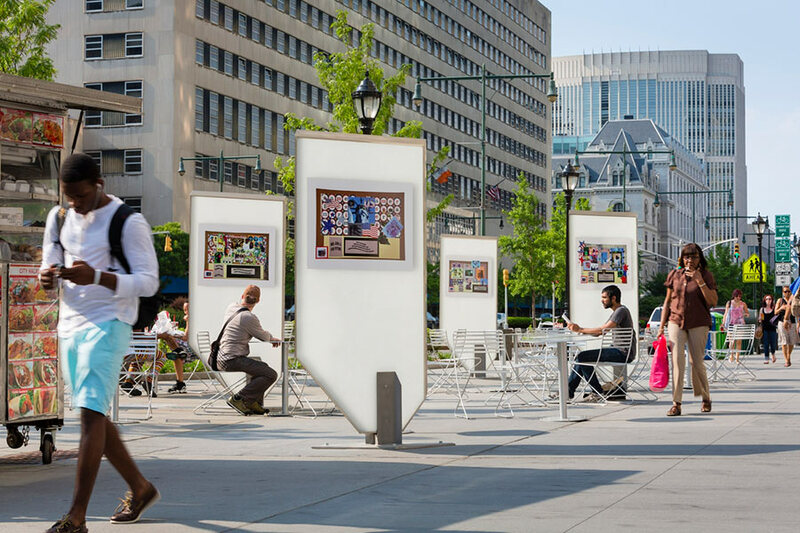 The exhibit will now be moved other public spaces around New York City. All images by James Ewing / Courtesy NYCDOT.